Planting a plethora of veggies in the garden seemed like a good idea early Summer, but now that things are in full bloom and growing faster than weeds, you might have an uneatable amount of vegetables on your hands. But don’t fret just yet. We have the perfect recipe to use up your harvest. It’s so good in fact, that we promise friends and family won’t roll their eyes at ANOTER zucchini recipe. 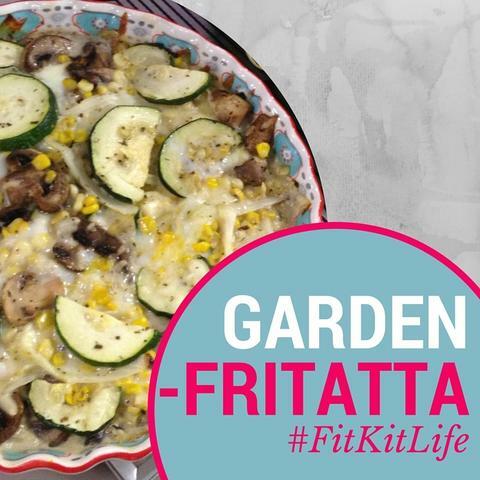 This frittata is the perfect dish for Sunday brunch or a quick weeknight family meal. Preheat oven to 375. Add olive oil to a large pan, and sauté vegetables (zucchini, onion, mushrooms, corn) on medium heat for 8-10 minutes. Meanwhile, in a separate bowl, whisk together eggs and spices (basil, oregano, black pepper, optional salt to taste). Place sautéed veggies into a greased pie pan, and top with shredded cheese (swiss and mozzarella). Pour egg mixture on top, and arrange zucchini slices to be flat on top for aesthetics. Pop into the oven for 20 minutes. Allow frittata to cool for 10 minutes before slicing.